It’s a common misconception that medieval minds regarded every little gadget with superstition and fear. Like us, medieval people loved wearable tech, and adapted useful gear – like sundials – to take with them on the go. In the thirteenth-century, Europeans were keen to get on board with the latest high-tech gadget to come out of Italy: eyeglasses. Glasses were one of those inventions that seemed to spring up from many inventors’ imaginations at the same time – making it impossible to pin down who the first inventor was, no matter what the good brother may have said – but Italy seems to have been the hotbed for optometry. This, perhaps, is not so surprising, given that glassmaking and Italy went hand-in-hand in the Middle Ages: some of the most impressive and sought-after medieval glassware was known to be made by Venetians. Medieval glasses didn’t have arms to go over the ears at first; they were of the pince-nez variety with two lenses riveted together in the centre. This meant that wearers would either have to hold them while using them, or pinch them tightly onto their noses to keep them in place. Not super-comfortable, but worth the effort. These early glasses featured convex lenses to help the farsighted focus on items up close. Concave glasses were invented in the Early Modern period (Gies & Gies, p.227). As James B. Tschen-Emmons notes in Artifacts from Medieval Europe¸ “Bone, wood, or metal were used for frames at first, but in time wire and leather might also house the lenses” (p.259). Leather glasses sound amazing. As time passed, glassmakers became so proficient and knowledgeable about their product that it was possible for the Duke of Milan to order 200 pairs in 1466, all of varying strengths. The Duke specified that he wanted the strength of the lenses to increase based on an average person’s ocular degeneration from ages thirty to seventy in five-year intervals, presumably so that he’d have a new, stronger pair to wear every five years. This means that his glassmaker had the information to create such a variety (Tschen-Emmons, p.261), which in turn suggests enough glasses were being produced that glassmakers could figure out averages such as lens strength based on age. That’s pretty impressive. While it was probably difficult for the lowest classes to buy glasses – our friend the duke was generous enough to buy glasses for young people with vision problems, too (Tschen-Emmons, p.261) – they had to have been somewhat affordable for them to be as ubiquitous as they seem to have been. The variety of materials with which glasses could be made would have helped make them widely affordable. And stylish. Apparently, medieval hipsters were wearing glasses for fashion’s sake before they became cool (Tschen-Emmons, p.261). 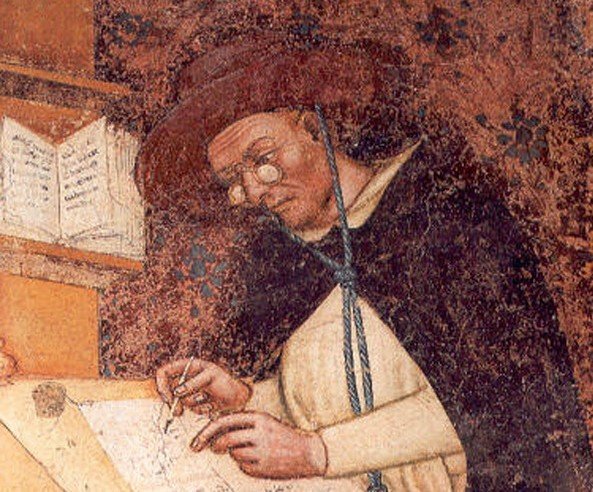 The earliest recorded image of glasses is a fourteenth-century fresco painted by Tommaso da Modena in Treviso, Italy, which features a portrait of a bespectacled cardinal who actually lived before eyeglasses were invented (Tschen-Emmons, p.259). Artistic license, right? One of my favourite images of medieval glasses, though, is just the outline of them, found in an eleventh-century book, which you can find on Erik Kwakkel’s blog. Kwakkel also features a pair of wooden glasses a medieval person lost by dropping them in the toilet, which just goes to show that glasses were as hard to keep track of then as now. Some things never change. For more on the fascinating history of medieval technology, I recommend Jean Gimpel’s The Medieval Machine, Frances and Joseph Gies’ Cathedral, Forge, and Waterwheel: Technology and Invention in the Middle Ages, and James B. Tschen-Emmons’ Artifacts from Medieval Europe. Thank goodness for medieval wearable tech.